Your Family Vet provides modern, professional and affordable health care for your pets. We aim to provide the best possible care for your pets by individualising care plans and treatment options to optimise your pets' health and wellbeing with your personal requirements. Our dedicated staff and leading veterinarians are all passionate about pets and avid animal lovers. 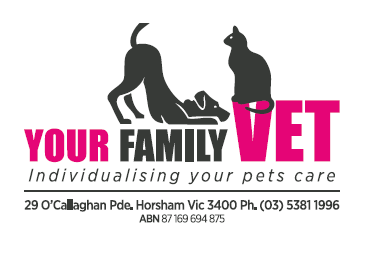 Your Family Vet is closely involved with local not for profit organisations such as Horsham Paws and Horsham Rural City Council to rehome abandoned and homeless animals. We also treat injured local wildlife free of charge and contribute to local charities. Being strongly integrated with our local community is important to us and our clients. Our customers know by experience that they can rely on us for sound advice and treatment options and that their pet is in the very best hands with our team. We’re open 6 days a week for consultations. Emergency attention is available out of hours by calling the clinic number for emergency veterinarians mobile number. Consultation is by appointment please.